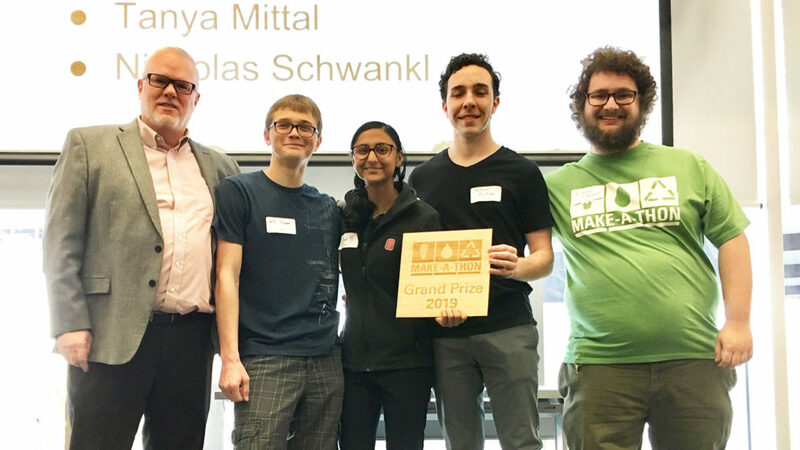 Students Jackson Bostian, William Jordan, Tanya Mittal and Nicholas Schwankl accept the Make-A-Thon grand prize from Mike Mullen, Vice Chancellor and Dean for the Division of Academic and Student Affairs. More than 125 NC State students spent Feb. 1 – 3 creating solutions for sustainability challenges. At the university’s annual Make-A-Thon, more than 30 teams researched, designed and prototyped sustainability innovations using resources ranging from 3D design and internet of things to geographic information systems and microcontrollers. On the competition’s final day – about 48 hours after Make-a-thon began – judges representing industry and campus partnerships listened to teams’ product pitches and selected winners. Imagine smart windows that adapt to the changing level of sunlight. In this energy-saving system, window shades and indoor lighting would automatically adjust to the sun, providing the optimal level of lighting for building occupants. An Internet of Things-connected sensor could help save $300 a year in residential water use. A companion app challenges users to save water while Machine Learning helps identify water leaks before they become major water wasters. Recycling requires a market for the recycled material. If recycled plastic is integrated into a new type of pre-made concrete mix, this could reduce plastic waste while also simplifying the plastic recycling process. A variation of a hack-a-thon with a sustainability twist, Make-A-Thon is organized by NCSU Libraries, University Sustainability Office and three University Housing living and learning villages: Engineering Village, EcoVillage and Albright Entrepreneurs Village. With sponsorship from Autodesk and several campus departments, students competed for nearly $5,000 in cash and prizes. Though Make-a-thon is over, many teams indicated their idea isn’t. Between university funding opportunities such as the Sustainability Fund and the Lulu eGames, it’s possible some projects could become reality. Published in News, Students, Uncategorized.